The world’s oldest perfumes have been found on Cyprus by a team of archaeologists. The perfumes were scented with extracts of lavender, bay, rosemary, pine or coriander and kept in tiny translucent alabaster bottles. The remaining traces found in Pyrgos, on the south of the island, are more than 4,000 years old. 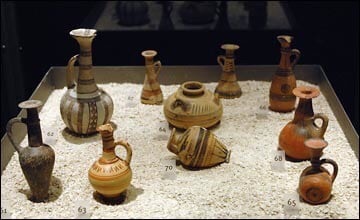 At least 60 distilling stills, mixing bowls, funnels and perfume bottles were found perfectly preserved at the site, which had been blanketed in earth after a violent earthquake around 1850 BC. The abundance of perfumes fits well with Cyprus’ mythological status as the birthplace of Aphrodite, the Greek goddess of love. “The goddess’s myth was strongly linked to the perfume she used to get what she wanted,” said Pavlos Flourentzos, head of Cyprus’s antiquities department. The finds are now on display at the Capitoline Museum in Rome. In addition, four of the perfumes have been recreated from residues found at the site. An Italian foundation which aims to recreate antique traditions distilled them according to techniques described by Pliny the Elder, by grinding the herbs, adding them to oil and water, then burying them in a small long-necked jug over hot embers for 12 hours. “It smells good, but strong,” said Alessia Affinata, a 30-year-old visitor. “I can smell the pine especially,” said Giulia Occhi Villavecchia, 23. Neither woman, however, was sure that they would actually wear them.